Two years after its launch, the ADBA Scottish National Conference returns for the third time in February to Glasgow at a time of major shifts in the UK and abroad. It will be a timely opportunity to bring together the Scottish AD community to discuss pressing issues, growing opportunities and policy changes that specifically affect the Scottish AD industry. Scotland is ahead of England on food waste collection and treatment and there are now over 50 AD plants in Scotland. The scope for growth in the sector is huge but it also faces many challenges. Scottish industry and policy makers are looking for solutions to ensure Scotland can achieve its potential. How does Brexit impact Scotland achieving its zero waste targets? What new technologies are available that can change plant performance? 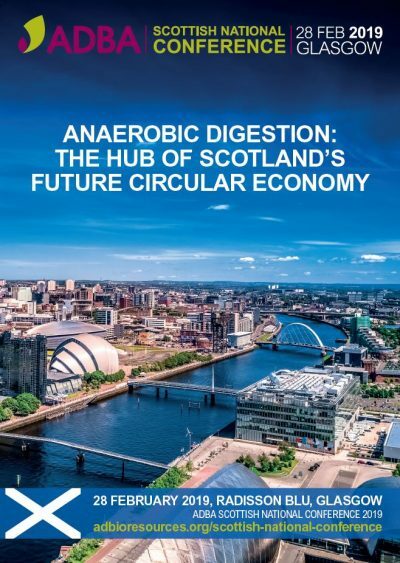 What are Scotland’s plans for agricultural reform post-Anaerobic digestion: the hub of Scotland ’s future circular economy CAP? A programme of panel debates and keynote speeches from leading industry experts will address these and other key questions alongside, best practice and technological advances that can improve performance. The conference will also showcase case studies from some of Scotland’s on-site AD projects, such as distilleries. We will be welcoming some of the most respected AD professionals from Scotland and the rest of the UK, including: AD operators and developers, farmers & landowners, government, local authorities, academics, food & drink industries, investors, technology and equipment providers to share expertise and experiences and get up to date with the latest developments in the Scottish AD market. Join us to help build on the success of Scottish AD and secure its place at the hub of Scotland’s circular economy.